On September 19, 1931, soldiers of the Kwantung Army (even­tually the largest, most pres­ti­gious branch of the Impe­rial Japa­nese Army) invaded Man­chu­ria in North­east China from their base at Port Arthur (present-day Dalian or Lüshun Port) and estab­lished a pup­pet state they called Man­chu­kuo. This event was a mas­sive act of insub­ordi­nation against the express orders of the poli­tical and mili­tary leaders in Tokyo. Suddenly thrown into dis­array, the leaders were power­less to stop the erup­tion of locally based Japa­nese aggres­sion in Northeastern China. None­the­less, Tokyo dis­patched rein­force­ments to Man­chu­kuo from Japan and Japa­nese-held Korea and ini­tiated large-scale “anti-bandit opera­tions” to quell a growing resis­tance move­ment in the country’s newest possession. For the rest of the 1930s Japa­nese mili­tary and civil­ian offi­cials were of two minds: expand their im­perial holdings west and north from their Man­chu­kuo base by attacking Inner Mon­go­lia (1933–1936 skir­mishes), the Soviet Union (Siberia), or the Soviets’ proxy state, Outer Mon­go­lia (present-day Mon­go­lia) (1938–1939, deci­sive Soviet vic­tories). Either that or expand south by attacking equally tempting West­ern colo­nial holdings in British Malaya and Singa­pore, the Dutch East Indies (present-day Indo­ne­sia), and the Ameri­can Philippines (see map). In July 1940 the Japa­nese govern­ment formally decided on a twin policy at least to the south of Man­chu­kuo: first, win the existing war (since 1937) on China’s main­land by inter­dicting the life­lines that brought West­ern arms, muni­tions, and related mate­riel to their Chin­ese enemy; and, secondly, gain access to the desired raw mate­rials from Malaya and the East Indies, if neces­sary by starting a new war in Southeast Asia. 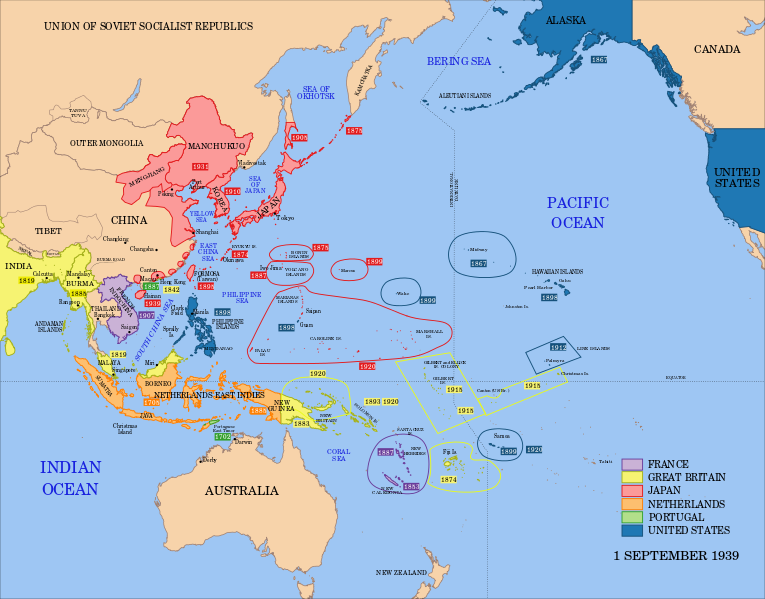 Toward the end of Septem­ber 1940, Japan took the first step in imple­menting this plan and moved troops into the north­ern part of French Indo­china (present-day Viet­nam) by agree­ment with the Ger­man vassal state of Vichy France. On this date in 1941 Japa­nese offi­cials shelved any plans for expan­sion north­ward or west­ward from their Man­chu­kuo base. Two days later, July 2, 1941, the Liai­son Con­fer­ence, con­sisting of senior Japa­nese govern­ment offi­cials and Army and Navy gene­ral staffs, formally con­firmed the deci­sion to expand south­ward. This was the moment when war between Japan and the Western powers became inevitable. Above: A map of imperial pos­ses­sions in the Asia Paci­fic region as of Sep­tem­ber 1939. The start of the Second Sino-Japa­nese War (1937–1945) was the inau­gu­ral event in World War II and argu­ably the dead­liest, cost­liest global con­flict ever. The total num­ber of Chinese mili­tary and non­mili­tary dead was upwards of 20 mil­lion, with maybe 15 mil­lion wounded. Addi­tion­ally, Japa­nese “kill all, loot all, burn all” opera­tions created 95 mil­lion Chi­nese refu­gees. Chi­nese forces claim to have killed at most 1.77 mil­lion Japa­nese sol­diers during the eight-year war. The Paci­fic islands en­circled in red lines (the Northern Marianas, Carolines, Marshall Islands, and Palau groups) are former Ger­man posses­sions under Japa­nese adminis­tra­tion following World War I. They would play a major role in facili­tating Japa­nese vic­tories over the Allies in the early years of the Pacific War.